eBird sightings of what birds are nearby. Paid membership of regional or worldwide coverage. Not a traditional field guide app. Outside of North America, membership does not include vocalizations. These require and in-app purchase. 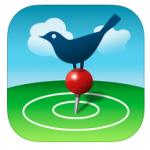 BirdsEye is the perfect app for birders of any level, naturalists and educators. The free version of BirdsEye includes the 100 most common birds near you (or for any spot on earth), and stunning photographs from top birders, bird photographers and guides. When you are ready to see more, paid subscriptions give you access to every countable species in your region or worldwide. BirdsEye is much more of a bird-finding app than a field guide. As a field guide (which is how it’s rated here), it leaves a lot to be desired. But as a bird finding guide it is actually quite unique and powerful. I wrote it, so I’m biased, but trying to be objective here! The information and content is crowd-sourced, so the quality is uneven. The completeness in some sense is very good, in that it includes every species on earth. However, text images and recent sightings are lacking or limited for many species. Provides many features not available from books, like the ability to get a list of nearby species for just about anywhere on earth. However the usability of those features are clunky and irritating in spots.